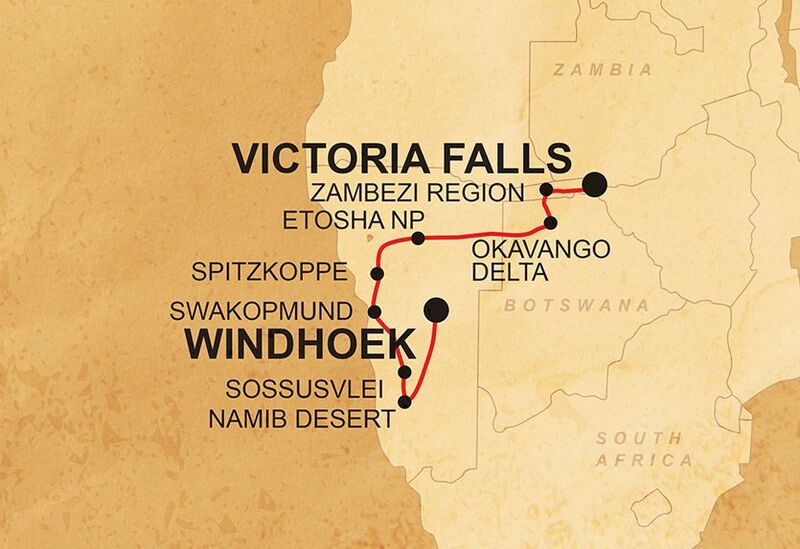 On this epic trip through Zimbabwe, Botswana and Namibia, we will be travelling overland, using a combination of overland vehicles, boats, and 4x4s, thus cutting out the need for air travel and reducing carbon-emissions. Going overland (by car and on foot for excursions) means you get to experience physically crossing the borders between countries as well as explore places which are off the beaten track. We have a strict set of rules regarding wildlife-spotting, for example when in the Etosha National Park. In order to minimise the impact of our presence on the wildlife and ecosystem of the areas where we travel, we explicitly forbid any involvement in activities that harm or exploit animals, and advise our crew in specific activities to avoid in this regard. We use local guides and operators throughout the trip; for example, in the Okavango Delta, Etosha National Park and in Swakopmund we use a responsible local operator that provides training and employment to many local people as guides, providing them with stable employment in the tourism industry.